The NANO Extruder machine represents the state of the art in the production of hollow core slabs suitable for use as either non-load bearing partition walls or as a thin floor slab elements. Depending on the type of elements to be produced, the NANO extruder from Nordimpianti offers cost-effective solutions for companies who are looking for a flexible approach to produce thin hollow core walls and floors in various sizes and applications. 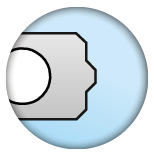 The Extruder machine casts elements in a single phase using the extrusion method. 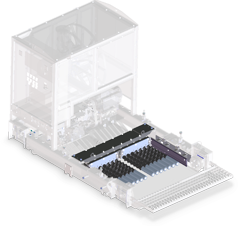 The machine is modular and a slab-specific product module can easily be changed in order to produce an element with a different height. 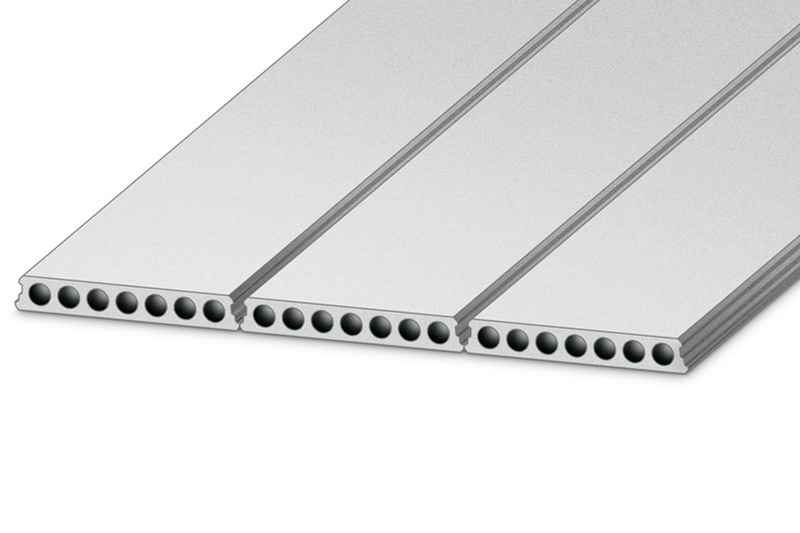 Standard element heights range from 80 mm to 120 mm and is available in widths of 2x600 mm. 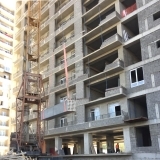 The heights of the elements, as well as the thickness of the vertical ribs can be varied within certain limits according to the application and the element specifications required. Concrete is delivered to the two hoppers (1, 1a) and by gravity falls onto the Archimedean screws (2). The screws then drive the concrete into the compaction chamber (3) where the forming tubes (4) are situated. Screws, together with the forming tubes, the side formers and the vibrating top plate (5) give excellent concrete compaction at every point along the element ensuring the element’s excellent technical characteristics. The NANO extruder machine is made up of 3 main parts, a universal casting module, two hoppers and a slab-specific product module. As well as being the main structural component of the machine, the universal casting module also consists of the drive unit for the screws, the wheels, which can be adjusted to change the height of the machine, the support feet for when the machine is parked, the mounts for the sideformers and the vibration assembly. The universal casting module also contains a slab-specific product module, the type of which is dependent on what product is being produced. The universal casting module houses the control box fitted with a convenient touch screen operator’s panel. If necessary the machine can be fitted with a cable reel to supply power to the machine depending on the customer’s own installed electrical supply. The NANO extruder has two hoppers, one above the other. The upper hopper has a capacity of approximately 1 m3. This main hopper allows continuous concrete feeding to the lower hopper by means of a manually operated special double-opening system. 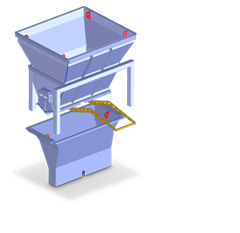 The lower hopper then distributes the concrete within the machine. 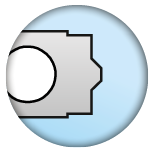 Slab-specific product module includes the Archimedean screws and the forming tubes. 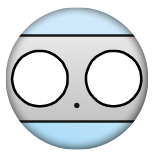 Two slab-specific product modules are available. Changing between the two slab-specific product modules is a simple and straightforward operation and can be done in less than 1 hour. To adjust the production height between 80, 90 and 100 mm it is only necessary to change the forming tubes and to fit the correct spacer under the lower hopper and vibration group. 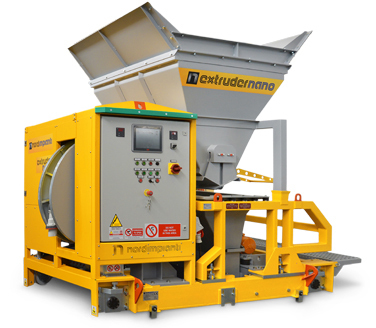 The NANO Extruder from Nordimpianti does not require the use of special production beds. It can be used on the same steel beds that produce the standard hollow core slabs as well as on the more simpler concrete casting beds. On the same steel casting beds the NANO Extruder can cast 2 x 600 mm elements simultaneously or 1x 1200 mm floor slab. Compared to other production systems available on the market, the NANO Extruder can increase productivity by 100%. This is because the NANO Extruder can cast two 600 mm wide panels at the same time instead of just the one element produced by competing systems. 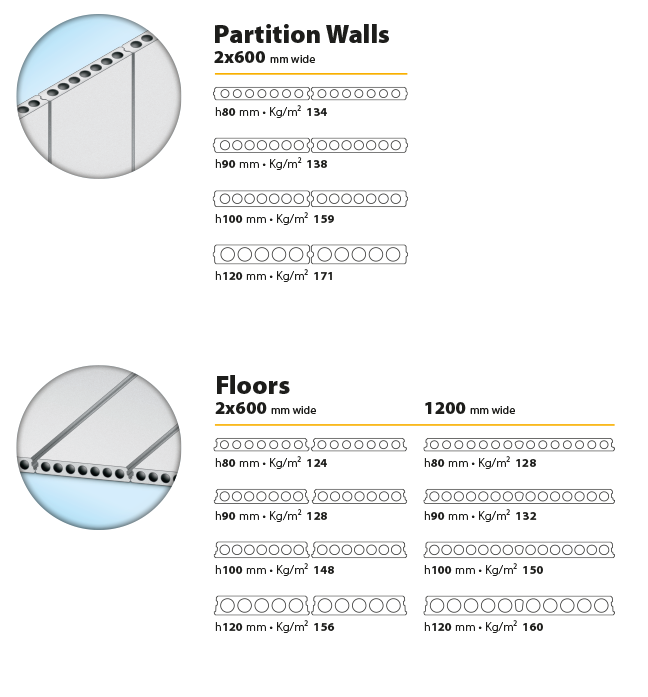 Moreover changing production between thin floor slabs and non-loading partition wall panels is a simple operation requiring only a few steps. The concrete compaction and the product finish is of the highest quality guaranteed by the latest generation of extrusion technology. The NANO extruder is extremely flexible and can be configured in many ways. 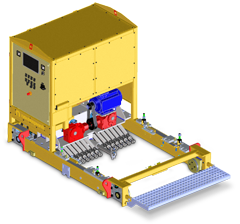 The NANO Extruder works on the same rails using the same equipment as on the standard 1200 mm production beds for prestressed elements. This gives companies the opportunity to diversify their production of prestressed elements with minimal investment allowing them to extend their range of products to include elements for partition walls or to offer thinner floor panels.